The restyled Veranda restaurant in Las Vegas is light, airy and reminiscent of an Italian trattoria. Guests can choose to dine indoors or al fresco on the sprawling outdoor terrace. Veranda's reimagined Italian menu serves up handmade pastas and fresh, seasonal favorites from the restaurant's wood-fire oven. Two private dining rooms offer space for intimate gatherings. 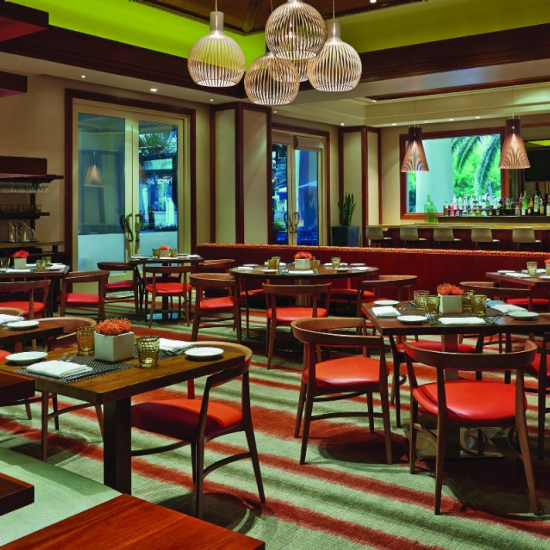 Veranda offers a relaxed dining experience for breakfast, lunch and dinner. Its comfortable sophistication is reflected in its warm, natural decor. Veranda is partnering with Las Vegas-based Able Baker Brewing Company to host a beer-pairing dinner on Friday, May 3, 2019 coinciding with the release of the new PRESS beer at Four Seasons Hotel Las Vegas. In an effort to conserve water, ice water is available upon request. Additional gluten free items available upon request. Consuming raw or undercooked meats, poultry, seafood, shellfish or eggs may increase your risk of food borne illness, especially if you have certain medical conditions. Some menu items may contain nuts. A photo is worth a thousand words. Share photos of your favorite Veranda dishes on Facebook or Instagram and Twitter using the hashtag #VerandaFS. A Gratuity of 20% Will Be Added to Parties of Eight (8) or More. Some menu items may contain nuts. Afternoon menu served 3 P.M. – 5 P.M.
Take a left at the large windows in the front lobby and follow pathway to the left. Take staircase down to the beach level and take a left. Veranda will be on the right. Enter the doorways from the garage area and proceed on cobblestone walkway. Follow pathway as it veers to the right. Take left onto casino floor and follow pathway toward the lobby. Take a left at the large windows in the front lobby and follow pathway to the left. Take staircase down to the beach level and take a left. Veranda will be on the right. Lupo by Wolfgang Puck was the chef’s first Italian restaurant. Specializing in tableside service and with exhibition pizza, antipasto and dessert stations on full display, Lupo sets the stage for guests to watch culinary creations come to life. Featuring a spacious center bar surrounding a glass enclosed wine room, Lupo by Wolfgang Puck’s exceptional service, cuisine and hospitality showcases why it continues to be the preeminent Italian dining destination in Las Vegas. Private dining is also available.